Little league is an eye-opener for small children. It’s the first time they let go of their mom’s hand and run head-on into the field, and into something unknown. All over the country, unmistakable signs of spring are popping up: melting snow, sunny days, and budding flowers among them. Another of these signs is spring training, and it has fans of America’s favorite pastime breaking out their caps and gloves in anticipation. Soon, baseball season will begin and fans new and old will flock to stadiums to root for their team. Some young fans will surely be inspired by Kevin Christofora’s children’s baseball book, The Hometown All Stars, an interactive new story that sparks interest in the sport. While The Hometown All Stars is a delightful book that makes for a perfect bedtime story, it’s also meant to teach children some very real and important values. Discipline, teamwork, and strategic thinking are just a few examples of skills applicable to daily life that can be learned through baseball. Learning these tools early can set kids up for future success in the classroom and beyond. Author Kevin Christofora, an avid baseball lover, feels so passionately that children should learn the sport that it factored into his decision to leave a career in the big city. Now a little league coach, he says, “Little league is an eye-opener for small children. It’s the first time they let go of their mom’s hand and run head-on into the field, and into something unknown.” Christofora also states that baseball aids in development, from learning how to interact with other children to waiting their turn and taking direction, all of which become vital in school. The Hometown All Stars is a great book to introduce children of all ages to baseball and the values to be learned from the sport. 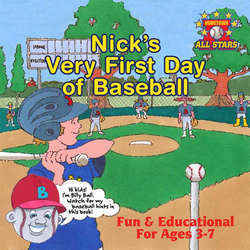 A fantastic learning tool, Christofora’s story enables children to learn and get excited about America’s favorite pastime.